Join us for the first scheduled ride of the season as Second Officer Mark Bamberger leads us on a ride through country roads over to visit the Wolf Creek Habitat & Rescue over in Brookville Indiana. Join us for an optional breakfast at 0800 at KJ’s Restaurant in Germantown or for kickstands up about 0900. If you’re not riding, you can also join us at the Sanctuary about 1100. Viewing the wolves is free. If you wish to get in and interact with them a $25 donation is requested. As you’re all aware, I’ve struggled for years now to try to keep the Chapter running with limited help. I’d like to see the Chapter continue, and to do so, we need new help, fresh blood and fresh ideas. To that end, I’m officially appointing Mark Bamberger as my Second Officer. You may recall that Mark joined us last year, and has lead several rides and participated in rides with a number of other Chapters. Mark has already recruited several new members to the Chapter and has a number of ideas and ride proposals to discuss at the upcoming Ride Planning Meeting tomorrow. Please join me in welcoming him to his new position (or perhaps wish condolences 😉 and be sure to join us tomorrow in Lebanon for the Ride Planning Meeting so we can get 2019’s riding season off to a great start. Please join us and help plan the 2019 riding season. It will be here before you know it. We’ll be meeting at Buffalo Wild Wings in Lebanon at 7 pm on February 6, 2019. Join us for a snack or dinner and discussion on the 2019 season. If you aren’t already a member of the Cruisers, come anyway. We always welcome new faces and the club is open to all bikes, bike types and riders. There is no charge for membership (but you do have to buy your own dinner 😉 ) RSVPs appreciated so we know how big of a table we need! Please welcome new members Tony and Lisa Dilts. They hail from Springfield and recently joined us on their first ride, the Fried Bologna Run. Please be sure to say hello when you see them on their next ride. They’re the ones on the bench in the picture below with Dee. Did you miss the Fried Bologna Run? Well, if you did, you have another chance at it. And a bonus! A visit to the Iron Pony motorcycle superstore! 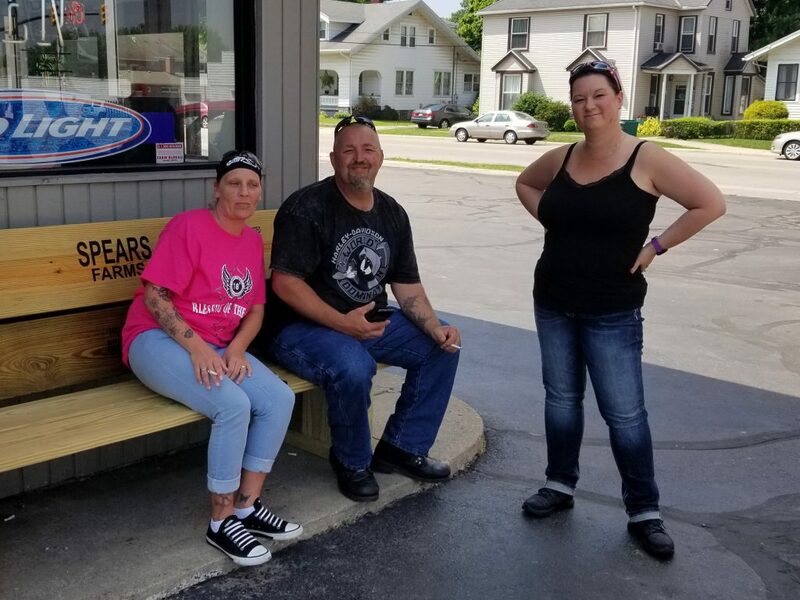 We’ll head up to Waldo to visit G&R Tavern for some more of that delicious fried bologna and some cream pie, before heading off to Westerville to shop at the Iron Pig. Heads up: Mom’s and G&R are both CASH ONLY. There are ATMs at both locations if needed. Remember our RSVP policy. Day of ride show ups are welcome, but without confirmed RSVPs the day before, the ride is subject to being cancelled at the discretion of the Ride Captain. “No” RSVPs are also appreciated so we know our ride announcements are being received. Now that we’re part way into the season, it’s become apparent to me that we’re going to continue to have the same issues with turnout that we’ve had for several years now. Hopefully with the recruiting that I, Mark and others are doing, this will become less of a problem. In the mean time though, it’s very frustrating to those of us planning and leading rides to have no response to ride announcements and no or very few show up. Thus, effective immediately, I’m instituting an RSVP policy. In order to guarantee that a ride will occur, RSVPs are required. Any ride without confirmed attendees by RSVP at least 18 hours prior to the ride briefing time is subject to being cancelled at the discretion of the Ride Captain. Day of ride show ups are and always will be welcome, but in order to ensure that the Ride Captain’s time isn’t wasted waiting on no one, a lack of confirmed riders may mean there isn’t a ride to attend. Further, if you know for a fact that you cannot attend, please have some respect for the Ride Captain and RSVP no. It’s equally frustrating to plan and schedule a ride and simply have no response, and it makes us wonder if the ride planning announcement is even being read. If you have any questions please don’t hesitate to ask. Thank you and looking forward to seeing you on our rides. Please join us for a ride up to enjoy the Ice Cream Festival in Utica Ohio, Saturday May 26, 2018. We’ll be meeting for an optional breakfast at 0800 at the Village Family Restaurant in Waynesville. If you’re not hungry, be sure to be there for the ride briefing at 0845 prior to a 0900 kickstands up. Please give a warm welcome to new member Kevin Massie! He was recruited by Mark Bamberger and has already attended a ride with us.